It’s the new cake for summer. Trust me. I’m probably the last blogger on the face of the planet to make a poke cake using sweetened condensed milk. I couldn’t really understand what all of the hubbub was about – I mean, I’ve had plenty of poke cakes before…although they’ve all used Jello. Like many of you, I grew up on cakes like those. And they were good, certainly. But fabulous? Meh. So finally, after giving in to temptation and curiosity, I decided to make one of my own. Aaaaaaand now…I understand what it’s all about. The moistness (sorry, it is, and I’m unapologetic to use a word that so aptly describes the texture of this cake), the decadence, the absolute diet-ruiner of this cake is bar none. Butter cake. Sweetened condensed milk. Cream of Coconut. Pineapple. Whipping Cream. Coconut. I’m basically drooling again just thinking about this cake, and I have a million ideas for different versions running through my head. I already can’t wait to make another one. In this version, I mixed together sweetened condensed milk, cream of coconut, and pineapple juice, and poured it on top of my warm cake. I was a little alarmed by how saturated the cake was at first, but don’t worry! All that oooey goodness is going to seep into your cake as it sits in the refrigerator overnight – I promise. Then you’ll top your cake with crushed pineapple and a homemade whipped cream flavored with coconut. 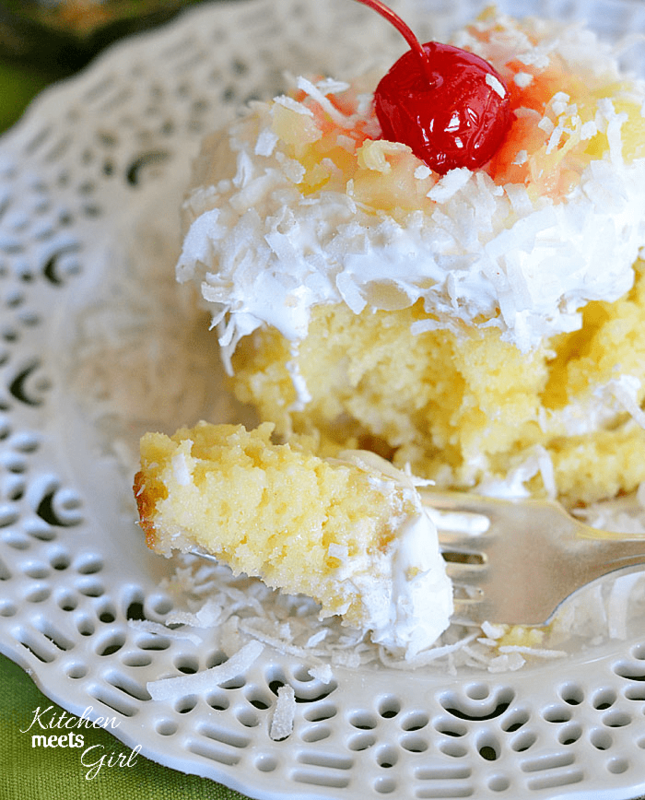 Garnish it with shredded coconut and a cherry, and one bite will transport you to a tropical flavored paradise. Pull the elastic-waist pants out of the drawer and keep eating. Prepare and bake cake in a 9x13 pan according to package directions. While your cake is baking, mix together the reserved pineapple juice, sweetened condensed milk and cream of coconut until smooth. Immediately after removing your cake from the oven, use the end of a wooden spoon to poke holes all over the top of the cake. Pour the milk mixture over the top of the warm cake, making sure to get it down into the holes. The cake will appear very saturated, but that's okay. Evenly spread the reserved crushed pineapple all over the top. Cover the cake with plastic wrap and refrigerate overnight. Beat cream vigorously by hand with a whisk or using the whisk attachment of a stand mixer. When the cream starts to thicken, add in the powdered sugar and coconut extract. Continue beating until soft peaks form. You may also use Cool Whip if you wish. 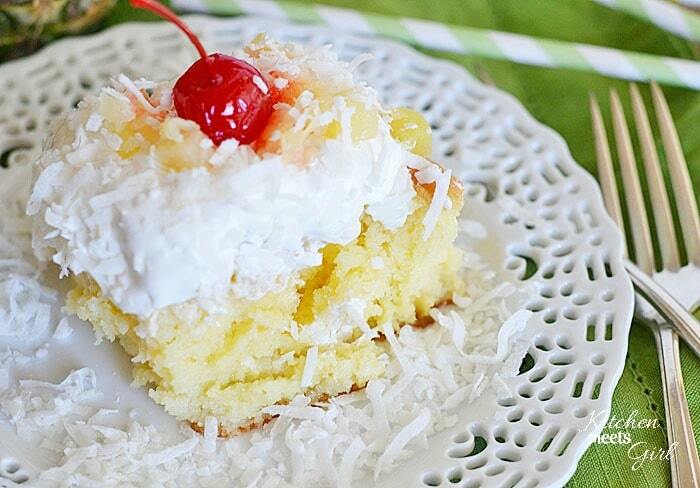 Garnish cake with shredded coconut and maraschino cherries. Keep cake covered in refrigerator for up to 3 days. Ashley…You’re aren’t the last – I’ve never made one either! This looks amazing – I love all of those flavors together 🙂 And I adore that white plate – so pretty!! Is it possible to post recipes that start with flour and not cake mixes (or other pre-packaged ingredients)? There are no cake mixes where I live. This was the BEST cake I have ever eaten! I loved it. I just can’t stand it. Looks amazing! I want a bite (or a whole cake) right now. This is one terrific cake, absolutely delicious! It was a nice Fathers’ Day treat. Highest recommendation. Saw this on Pinterest just now and knew it was yours – stunning photos Ashley!!!! I want to dig right in. I love pina colada anything! Sally, you’re too sweet. I need you to give me a one-on-one camera/photography tutorial! This version sounds sooo amazing. I was first introduced to ‘poke’ cakes through Tres Leches Cake (which I believe poke cakes stemmed from…), but I still haven’t posted one on the blog – hmm, how could I incorporate CandiQuik into one? Lol. I am definitely making this cake when an excuse comes up (as in it’s Friday, let’s celebrate and eat cake). Thanks for sharing!!! Hope you are having a great week. LOL, I think CandiQuik is good with just about anything! I’ve been thinking about those S’more Grahamwiches ever since you posted them! WHAT?!?!?!?!?!?!? I need a big ole slice of that right now!!!! Like Right NOW!!! Seriously Ashley this looks amazing! Don’t mind me while I wipe the drool off my face…looks to die for!!! It’s soooo good, Julie. As in, I can’t stop eating it, good. I need someone to stage an intervention. Oh this cake has been haunting and following me all day. Like it’s begging to be made 🙂 Seriously awesome Ashley!! You always have the most incredible cakes! 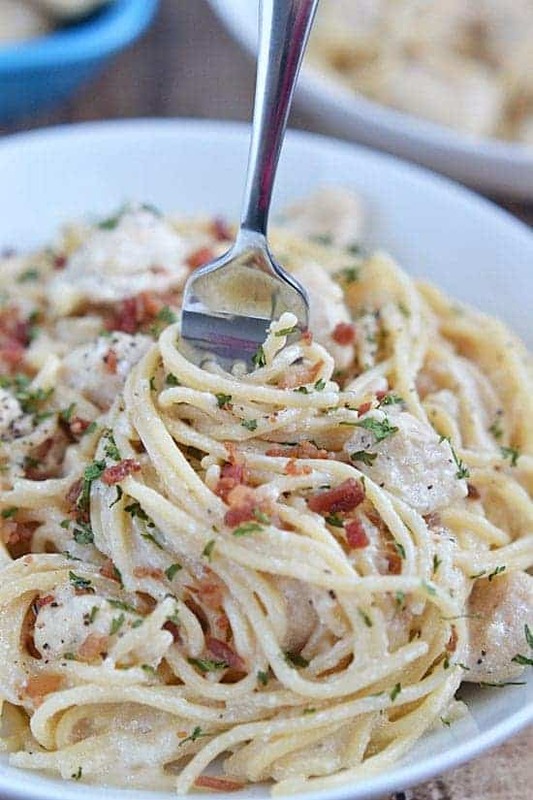 This looks really beautiful and flavorful and moist! Oh man, I just have to make one of these now!! I love love love this cake!! This looks like summer in cake form! Poke cake is THE BEST. Love this! Ooh, you’re so brilliant! This pina colada version looks AWESOME, Ashley! Aren’t poke cakes totally rad? I didn’t understand what the hubub with the scmilk was about until I tried it and was like, “…ohhhhhhhh! So THIS is it!” It’s really mind-blowing! Hayley @ The Domestic Rebel recently posted..20 Delightful Donut Recipes! I know, right? The sc-milk makes such a huge difference – I’m hooked! I am SO trying this Ashley! I just love it! Pinned! Delicious as it is…..and even tastier when I replaced 1/4 c of the reserved pineapple juice with rum! This looks amazing! Can’t find “butter cake” so I will try French Vanilla. My friends love my cooking, but this will take it to a new level, I am sure! Substitute the oil that is called for in cake box recipe with softened butter. This cake recipe is one of the best out there. I toasted the coconut and added some toasted finely chopped macadamia nuts for the top. I’ve a coconut lover and added a small amount in the batter too, just be careful too much weighs it down. Love the recipes you put out there, always a winner!!! I don’t really care who pinned this yummilicious cake, however I am THRILLED they did!!! This is one for a very special meal. Your pictures are fabulous and I love coconut on anything! I was just wondering if anyone has making this cake with coconut Malibu instead of the pineapple juice…. Someone made this and brought it over recently after I had baby #2 and I ate the whole thing by myself. I have since been craving it and with a party tomorrow I just had to make it!!! Oh how i love this cake..
What is the cream of coconut, it’s ingredients or substitutes cause I haven’t seen it in our local market before. I like to make the cake but don’t know what to use instead if I couldn’t find it. Please advise. 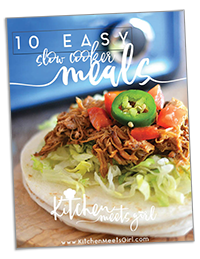 My roommate and I loved this recipe and ate it for pretty much every meal until it was gone! Two questions though – is there a specific amount of pineapple juice needed for the liquid component? My can of crushed pineapple didn’t drain out very much liquid and subsequently the cake didn’t have as strong of a pineapple flavor as I’d expected. Secondly, my cake came out delicious but kind of soggy, ugly, and difficult to serve. Do you have any suggestions to make it more tidy to serve at a gathering? Thanks so much! This is the first recipe I’ve tried from your site although I’ve been reading for a while now, and I’m very pleased! Hi Christina – I didn’t get a lot of liquid from my can of pineapple, either – maybe 1/4 cup or so. It’s important to allow the cake to refrigerate overnight to allow the liquids to soak in. However, the cake will get soggy after a day or so, so you’ll want to serve it right away. Could you please let me know what butter cake mix is as I live in the U.K. and have never heard of it? Judith, a yellow cake or white cake would work okay in this recipe also. Are there any non-pineapple versions or something close? We have a LO with pineapple allergy/intolerance. My mom has been making this for years, but without the pineapple. It is one of our family favorites, usually made on Birthdays. 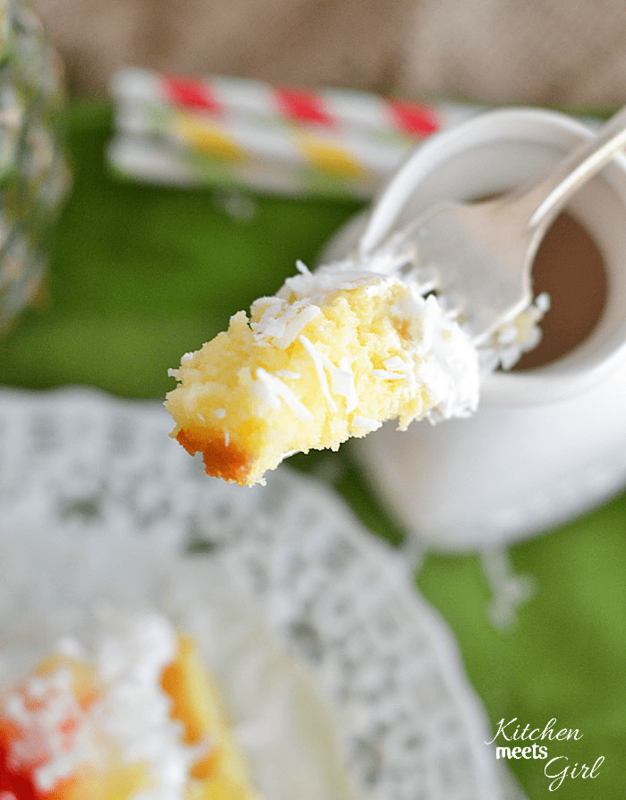 Could I use DH Coconut Supreme cake mix? Yes! That would be so yummy! Made the cake with the DH Coconut Supreme and it came out wonderful. Next I am going to use a Pineapple Upside Down cake mix. Thanks for the recipe, Ashley! 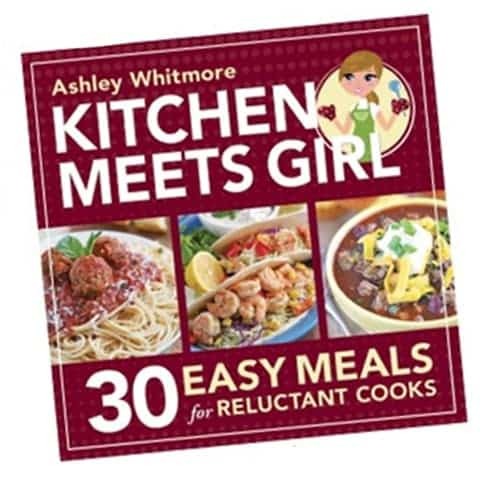 Ashley….this sounds yummy! Pina Colada drinks have rum in them. If I wanted to add rum flavoring, what do you suggest? Thanks! hi Im going to try to make this cake.. looks so yummy.. and I LOVE pineapple and coconut so SCORE! I had a question. where do the crsuhed pineapple come in. I thought it said something about having it on the cake but I didnt see it in the recipe. I just saw what to do with the reserved juice from it. Thanks!!! Why can’t they make this yummy stuff for diabetics … just not fair! We miss out on ALL they really yummy desserts, I’d make it anyway. wanted to share that I posted this on my blog after trying your recipe.. I am in LOVE!!! I just made this cake for the first time using a box of yellow cake mix that I already had in pantry. After out of oven, I poked several holes and while pouring mixture all the liquid was running to the sides of cake. My cake was slightly domed but I thought the liquid would just soak through. After sitting in fridge overnight, I still see the liquid on the sides of cake. Any suggestions would be much appreciated! Thanks!! Omg. Love this. Gonna have to make it tomorrow! 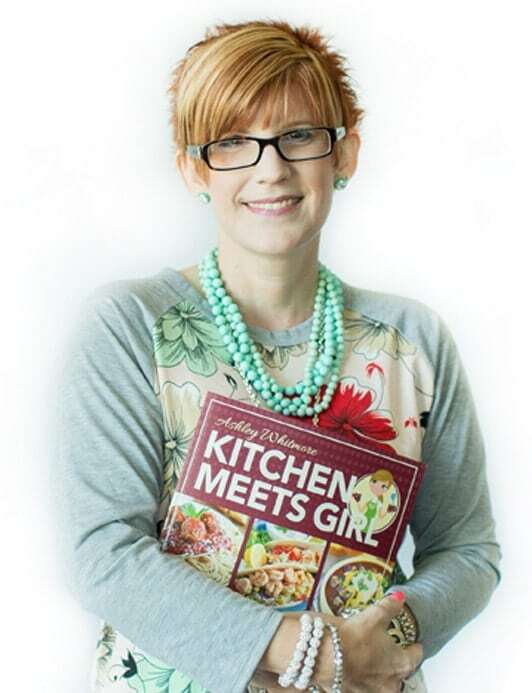 Hi Ashely, OMG i love this recipe! I will be getting married in October and we will be having a cupcake wedding cake with 4 flavors. I would love to use this as one of them, but I am worried about the texture of icing, as I know the cake will have to be set up early. I wonder will be icing hold up to room temperature. The cake I am not worried about, as those can be done overnight by the baker presumably. Please please respond! I recently made this cake, and it was phenomenal. I used a pineapple supreme boxed cake mix, and for the water called for in the box mix, I substituted pineapple juice. I also added some crushed pineapple to the cake mix when I baked it (yes I love pineapple) Next time I may cut back on the amount of condensed milk slightly. The cake did absorb the liquid, but it took quite some time. 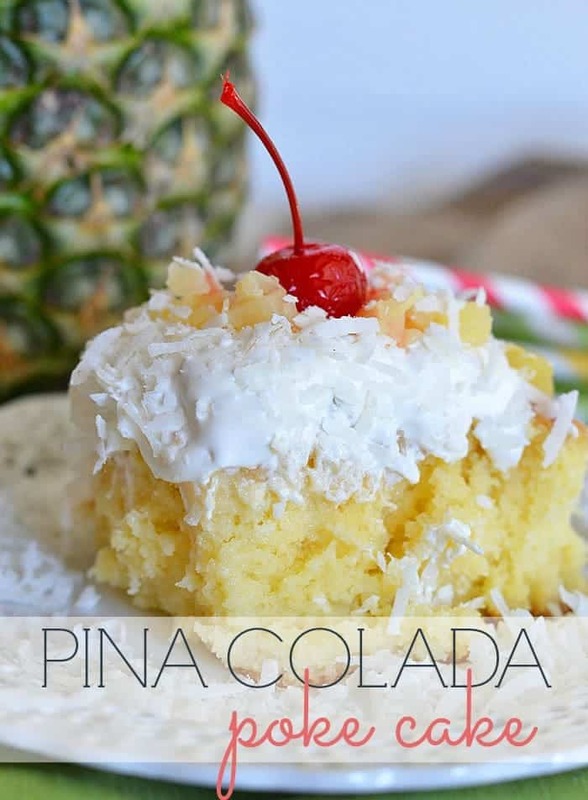 I would recommend allowing the liquid to completely absorb before adding the crushed pineapple to the top of the cake. I did 2 teaspoons of coconut extract for the whipped cream topping, and completely covered the top of the cake with shredded coconut and snipped up maraschino cherries. This is definitely going to be my summer cake I bring to parties!! Making this for my mom’s birthday cake …. Can’t wait to try it!!! I grew up eating this cake in my family. Just a little different rendition using only the Coco Lopez poured into holes, no scm and pineapple was mixed into the Cool Whip/Whipped cream topping. I’m making your rendition as we speak, I’m very excited to see how it turns out! I’ve made this cake for years and its amazing!! Everyone always say that they love it. I sometimes do tweak it a little by using either coconut milk or pineapple juice as a substitute for the water the cake mix requires. I sometimes even add the crushed pineapple in the cake batter. My friend even asked me for my recipe once and she said that she added shredded coconut in the cake batter. Easter Dessert in the making. Just wanted to let you know I took your recipe and tweaked it for a gluten-free cake for my Celiac daughter. Baking for gluten-free is often difficult. Here’s what I did in case you ever get asked. I used a King Arthur GF Cake mix, added a box of Jell-o Coconut Cream dry pudding mix (to help the cake hold up under all the moisture), upped the oil from 2/3 cup (indicated on box mix) to 3/4 cup to help with the extra dry ingredient, and Voila! It was superb! Thanks for the inspiration, you made our Easter celebration that much grander. Could you make the cake using the pineapple juice instead of water and mixing the crushed pineapple into the cake?